» Take a tour of Haridwar. Contact us. Haridwar travel is considered as the gateway to the four pilgrimages in the Uttrakhand region, The Ganga Haridwar leaves the mountains and enters the plains with Hardwar being the first major town on the plains. Though the Ganges Haridwar does not lose its rapids completely nevertheless it becomes very quite and calm here. The water is clean and people prefer taking bath on the numerous ghats built on the river shores. It is said that taking bath here purifies the soul and opens the way for the ultimate freedom, Nirvana. Haridwar has earned fame as being the place which has been blessed by the trinity of Lord Shiva, Vishnu and Brahma. It is also one of the major Shaktipeeths. Down the ages Hardwar has purified the mind, the body and the soul. Not only in spiritual or religious terms Hardwar has come up as a major learning center for arts, science and culture. This place has maintained the Gurukul tradition of teaching. This ancient tradition of teaching has maintained its fervor in Hardwar. Haridwar has since ages been a source of Ayurvedic medicines and has been providing herbal remedies. Hardwar one of the first towns to be developed on Ganges is still lush and green with forest and trees. With Rajaji Park in the vicinity Hardwar has also been the destination for the wildlife and nature lovers. The city acquires a unique charm in the evening when the ghats become breath taking beautiful with thousands of Diyas and Marigold floating in the waters of Ganges. About three and half lakh People reside in this city. Hindi, Punjabi, Garhwali and English are the main Languages of Communication. Tracek other important destination from the Haridwar map provided on our website. It is located on the foot hills of Shivaliks and on the banks of River Ganga. This major pilgrimage center is well connected by trains to all the major towns of India. 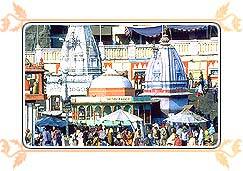 In fact trains bring the major load of pilgrims and tourist inflow to Haridwar. Haridwar is located at a height of almost 300 meters . One Should never expect any sort of pleasant high altitude climate here. During the summers the temperature usually hangs around 40 degrees but winters sees the mercury dipping as low as six degrees. So neither of the seasons are suitable or ideal for tourists for visiting Haridwar. The monsoons further add to the miseries of the visitors. Discover What To See in Haridwar. First visit the popular Har Ki Pauri, located in Haridwar, is one of the most sacred Haridwar ghat in India. People say that this ghat was built by Vikramaditya in memory of his brother Bhartrihari. This ghat is also known as Brahmakund. In the evening a Maha Aarti is performed on this ghat. It is an event which is must not be missed by any visitor. The floral diyas which float on the ghat in the twilight creates an impression of a stars being brought in the river water. During the day time the ghat is full of Pandas and Pujaris who sometime extract big money from the visitor. Avoid them if you can. The Haridwar Ghat is also full of beggars, they not only create trouble for the visitor but also make the place dirty. There are many hotels, guest houses and temples on this ghat. On the travel to Haridwar temple is on the top of a hill called the Neel Parvat which is on the other side of the river Ganga. The temple was constructed by the King of Kashmir, Suchat Singh, in 1929 AD. Chandi Devi is a three km trek from the Chandi Ghat. The story goes that Chanda-Munda the army chief of the demons Shumbh-Nishumbh were killed by Goddess Chandi hence the name Chandi devi. It also said that the original statute of Chandi was established by Adi Shankaracharya in 8th century AD. Now a rope way has been built which takes you to the top. Chandi devi is six kilometer from the main town of Haridwar. This temple is also located on top of a hill called the Bilwa Parvat. The temple can be reached by the rope way or one can take the normal trekking route to the top. The top of the hill gives you an excellent view of Haridwar. The temple is surrounded by many shops and you have to follow the line to have a glimpse of the goddess. One of the goddess has three mouths and six arms while another has eight arms. The trolly ropeway route to Chandi Devi and Mansa Devi, is very exciting. It is one of the Shaktipeeths in India. This ancient temple of Maya Devi is also the Adhisthatri deity of Haridwar. It is said that when Lord Shiva was carrying his wife Sati, who had burnt her self to keep the honour of her husband, then the heart and navel of Sati had fallen at this place. Fairs and Festivals. Patanajali Haridwar is a center of Yoga and Ayurveda activities in India built on the name of Maharishi Patanjali who invented Yoga 5000 years ago. The ashram is run under the guidance of Swami Ramdev Ji Maharaj who has revived Yoga and spreading it all over the world. Patahnajali Yog peeth provides various facilities such as Yoga Classes, Accommodation, Natural health therapies, Ayurvedic treatments, Accommodation, canteen, OPD and admiting patients for long term disease treatment. People gather in huge number to take the holy dip during these holy days. There are Saints, Naga Sadhus, Politicians almost every one is here. The city is overflowing with people. If going to Haridwar during the Ardh Kumbh then avoid the over crowded ghats. Every there are reports of stampedes and the various factions or Akharas of Sadhus clash with each other. Ensure your accommodation well in advance if going during the Kumbh. Indulge yourself in taking Haridwar photos temples. Ten days before Shivteras, during the Hindu months of Shravan & Phalgun, corresponding to the months of July and August, thousands of devotees throng Haridwar, all the way walking bare feet, to collect holy waters of the river Ganga. Then they carry it back to their hometown & offer it at the local Shiv Temple. Colorful shops spring up and Haridwar trip resounds to the chanting of hymns. In the region Air Services are available only upto Jolly Grant airport in Dehradun. The Railways have a station at Haridwar. This major pilgrimage center has been well connected by trains to all the major towns of India. In fact trains bring the major load of pilgrims and tourist inflow to Haridwar travels.THere are regular buses and cabs available from Haridwar to Badrinath which is is 320 kms. The National Highway No - 45 crosses through the city so it is connected to other cities of the State as well as other towns in India in an efficient manner. There are buses available from Delhi to this place. The state transport has ordinary as well as deluxe and semi-deluxe buses on this route for long distance travel. There are private buses avaialable too, which willtake you to nearby places and some of these private deluxe buses run on the long distance routes.